Updated June 13, 2018: Discussion and motions from the TTC Board Meeting added. At its meeting on June 12, 2018, the TTC board will consider a staff report which sets out in some detail the first stages of Toronto’s migration from diesel and diesel/hybrid buses to a zero-emission fleet. The TTC’s abrupt shift from diesel to zero-emission followed a July 2017 motion adopting the TransformTO climate change plan which included a reduction target of 80% by 2050. After continued defense of “clean diesel” technology on the basis of cost and reliability, ongoing problems with Hybrid buses, and a view that new technologies were not yet mature enough for system-wide use, the TTC has reversed course and embraced a move to buying only zero-emission vehicles by the mid-2020s. As older vehicles reach end of life, the diesel and hybrid fleets would gradually disappear. In September 2017 at an unusual Board meeting a vendor, BYD, was given the opportunity to make an extended product pitch as a “deputation”. This led to a more general interest in zero-emission vehicles from two other vendors (New Flyer and Proterra), as well as natural gas alternatives thanks to lobbying by Enbridge Gas. In November, the Board approved a 30-bus trial with ten vehicles from each of the three vendors, as well as a less definitive study of the role of gaseous fuels. A major problem through the entire process is that much of this is new technology, and there are many competing claims for its suitability that are not yet substantiated by real world experience. A recent article in the Los Angeles Times details problems with their battery buses and the gap between promises and actual performance. Toronto is just beginning to learn the cost of moving to a greener fleet and the escalation not only in vehicle costs but in related infrastructure. $50 million has been allocated for those first 30 buses, and a further $88 million is on the table for another 30 plus associated infrastructure. The report is deliberately vague about specific prices for vehicles because negotiations with vendors are still underway. Without extra investment by other governments, the technology change simply would not happen. In a November 2017 report, TTC staff noted that battery buses were “significantly less expensive” than other options based on the availability of PTIF funding. Indeed, the current plan is structured to burn through as much of the Federal government’s Public Transit Infrastructure Fund Phase I money as possible. When PTIF was announced, all projects to be part of the first phase were required to be finished by March 2019. This is partly a political date given the election next year, and partly an accounting requirement so that spending occurs within a few fiscal years (government fiscal years start on April 1). The PTIF deadline was extended from 2019 to 2020 when it became obvious that actually spending the new money would not be possible for many cities. Toronto found itself without projects either in the City or Transit budgets that could soak up the available money in only a few years, and initially the focus was on a massive replacement of the bus fleet to retire the worst of the older buses and, at the same time, shift from an 18-year to a 12-year replacement cycle. In this context – a subsidy windfall plus an unusually large, multi-year bus order – the opportunity for a fast change in technology presented itself both to the politicians and to the would-be vendors. Whether this will work out remains to be seen, but the TTC is moving cautiously with a trial program that will determine whether the new technologies are credible replacements for what we have today. Meanwhile, the TTC will shift back to Hybrids from Clean Diesel on the premise that Hybrid technology has improved since the less-than-reliable generation of buses they are about to retire. The quantity of electric buses will be increased from 30 to 60 with all vehicles to be delivered by March 31, 2020, and the TTC will work with Toronto Hydro on the design and installation of charging and energy storage systems; the project cost is increased from $50 to $120 million. The TTC will work with Toronto Hydro to modify one bus garage to accommodate up to 300 buses through the supply of a substation and backup generator at an estimated cost of $18 million. Staff will provide a project update in first quarter 2019 to the new TTC Board following the Council election in the fall of 2018. Staff will conduct a feasibility study of all garages and report in the fourth quarter of 2019 on “preliminary estimates for the total costs, benefits, and potential funding opportunities associated with the green bus plan”. Separately from these reports, staff will present a plan in July 2018 feeding into the 2019 budget process with updated capital plans and tradeoffs necessary to free up money for the new bus infrastructure. The revised fleet plan is shown in summary in Figure 3 (taken from the report) below, plus three tables showing details of procurements through 2020 for each technology. The plan shows a co-existence of Hybrid and Zero Emission vehicles through to 2024. By that date, the state of bus technology should have settled both to bring costs down and to establish the reliability of competing approaches. Although the TTC Board hoped to shift much of the current Clean Diesel order to Hybrid, this was not possible for much of the contract already underway for 2018. There will be no bus purchases in 2020 while the TTC digests the accelerated order under PTIF to replace a good chunk of the current fleet. Orders for 2021 and beyond will clearly depend on the outcome of trials to be conducted in 2019-20. By the end of summer 2018, designs for all vendors will be approved, and through the fall, the charging infrastructure will be installed at three garages. Vehicles will arrive with the first ten from each vendor coming first, followed by the remaining 10. The report lists many aspects of the technologies and requirements, and for convenience I have consolidated these into one set of tables. Note that the values for battery buses assume a 30-vehicle fleet, not 60. The report also includes a set of Key Performance Indicators that will be used to track each set of new vehicles. The total life cycle costs shown above deserve comment. The “original baseline” figure of $2.39/km does not include the effect of PTIF which reduced this value to $1.73/km in the November report. It is unclear whether the $2.02/km reflects changes in the estimated cost of vehicles and technology, or if PTIF money is involved. In any case, just as greenhouse gas effects are calculated including extraction, processing and transmission costs for fuel, the TTC should not artificially reduce cost estimates just because PTIF is available. Those are subsidy dollars that are not spent on other projects where there could also be a benefit that will not be achieved. A dollar is a dollar no matter where it comes from. I have asked the TTC for clarification of the numbers on this chart and will update the article when they reply. The timeline for implementation of the 60 eBuses stretches out to the fall of 2019 because it will take until then for the Energy Storage Systems needed to supplement charging capacity to be installed at the garages. The evaluation of sites took physical and geographic considerations into account. Birchmount and Queensway garages were ruled out due to ceiling height. Space at Eglinton is constrained, and so the BYD fleet will go there because the AC to DC power conversion is done on the vehicles rather than in the charging stations. The big challenge is provision of power with which to charge the buses. Charging would take place overnight and would add to the demand on each garage’s power supply. Power is not available at existing garages on the scale required to charge a large fleet, and even for the smaller trial, line power will have to be supplemented by an energy storage system. Existing garages have a 600V electrical distribution fed from a 1500kVA transformer owned by Toronto Hydro, with the exception of Arrow Road which is fed from a 1000kVA transformer that needs to be upgraded to a 1500kVA unit. Historical billing data from all garages indicates peak demand in the range of 650 to 885kVA occurring overnight and in winter months. With bus charging rates between 80 and 150kW per bus, the energy available for eBus charging is determined by the difference between the existing peak demand and the allowable continuous load. 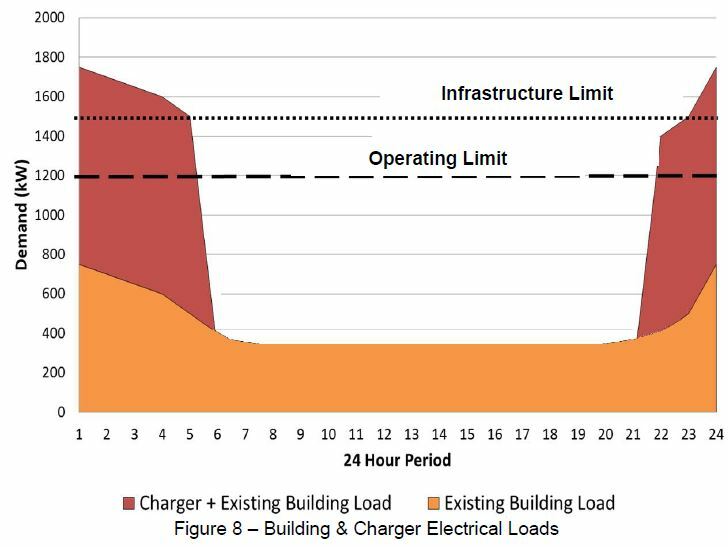 This limitation is driven by the fact that both the facility and charging demands have coincident peaks. To allow for the first 10 eBuses at home garages, an energy management system (software) will be used to curtail charger output in response to plant load and total vehicle demand. The energy management system alone, however, cannot accommodate a larger number of buses. To allow for more than 10 eBuses at any one garage, an energy storage system (ESS), which is essentially a large battery system, is required to help managing peak loads to within the 1500kVA limitation and to spread the charging window without exceeding the operational/infrastructure limit. An additional 10 eBuses at each garage would exceed facility peak energy limits. On a daily basis, the number of eBus service kilometers available is a function of the onboard battery capacity and the amount of energy that can be drawn from the grid. By examining hourly power demands at our garages, there is a reserve capacity that is not being used. ESS could be added to the existing electrical system and charged slowly during the day using existing spare capacity. These batteries could then be discharged supplement energy drawn from the grid, charging more buses than would be possible if the system relied on the grid alone and staying within the operational/infrastructure limit. The load pattern without a storage system are shown in the chart below. Using a storage system, some of the load is shifted away from the charging period. The idea of shifting some of the power draw by using a storage system gets around the constraint on available power, but at the cost of additional infrastructure and power losses through conversion. The batteries would not necessarily charge with “cheap” overnight power. Moreover, if there is a power outage, the fleet would be unable to operate without an auxiliary power supply. The TTC proposes that a backup generator would be provided to take over in case of an outage. Further to Item #2 (above), as we move towards the 2025 target for procurement of only zero emissions buses (i.e. 60 in 2021, 80 in 2022, 100 in 2023, and so on), it would be inefficient to continue modifying existing garages to accommodate only 20 buses each, even though potential sunk cost of the capital investment is low. To stay ahead of the bus procurements and to ensure efficient use of resources for the preparation of garages, electrical capacity must be added through the installation of substations and resiliency must be added through backup generators. The benefit of pursuing this additional scope now, besides the potential use of PTIF funding and the fact that our existing garages will have to be modified starting in 2021/2022 regardless, is that the modification is future proof. Whether the future of our fleet is comprised of all-electric, hydrogen fuel cell, CNG buses, plug-in hybrid, or a mix of these technologies, the substation and backup generator is required. It is unclear why CNG (compressed natural gas) requires a new substation comparable to that needed to power a 300-bus garage. I have asked TTC for clarification of this statement. The backup generator brings various technology options separate from the bus technology. There are three internal combustion solutions with various fuels available for backup energy generation. Diesel generators are the most common and can pick up loads within 10 seconds. Bi-Fuel generators that run on 30% diesel and 70% natural gas can also pick up loads quickly but are dependent on the ability to supply the bus garage with natural gas. Lean burning 100% natural gas generators are the cheapest to operate and emit the least amount of GHG emissions but can take between 4 to 10 minutes to start and take load and occupy a larger space footprint in comparison to diesel and bi-fuel options. Lastly, the use of backup generation power can also assist in curtailing global adjustment charges from the local utility company through peak energy shaving. A 5MW backup diesel generator costs approximately $5 million and additional $3 million for every 5MW added thereafter. As noted previously, both the substation and the backup generator will be required at all existing garages regardless of the future (non-diesel) technology. To keep up with zero emission bus procurements, the first garage must be ready in 2021 and additional garages must be retrofitted at a rate of approximately one every 1.5 to 2 years. The reference to peak energy shaving refers to the use of a generator to supply power during periods when high demand triggers higher power bills from Hydro. It is ironic that a “zero emission” technology could depend on a fossil fuel for some of its power. Indeed the more general issue of electrical power generation must consider byproducts of that process to keep environmental comparisons on an even basis. […] both the substation and the backup generator will be required at all existing garages regardless of the future (non-diesel) technology. To keep up with zero emission bus procurements, the first garage must be ready in 2021 and additional garages must be retrofitted at a rate of approximately one every 1.5 to 2 years. McNicoll Garage, now under construction, will continue based on its current design as a revision at this point would invite a delay in a project that is already badly overdue for the expansion of Toronto’s bus fleet. When the eBus proposal was before the TTC, Enbridge was a bit miffed that natural gas options were not on the table as a means of reducing emissions. The TTC’s experience with CNG was less than successful in part because of the then state of the technology and the less than robust equipment with which it was implemented. CNG buses now account for about one fifth of all buses in North America. That staff report back in one year on the transition from end-of-life diesel buses to CNG to ensure a mix of vehicle fleet energy types into the future. This is a rather oddly worded resolution because it is far from clear that a “mix” of energy types is how the TTC should go (nobody has suggested that one of our subways run on hot air despite its plentiful supply in these parts, and an all-diesel bus fleet was a common sight in Toronto and elsewhere for decades). The real questions are whether battery buses will actually perform well enough to become the mainstay of the fleet, or if CNG, as opposed to Hybrid diesel-electric, will win out as an alternative to batteries or some other technology like hydrogen fuel cells. Staff advise that they will report out on CNG later this year, presumably at the inaugural Board meeting in December 2018 after the municipal election. In Q4 2018, staff will report back with an report that provides recommended course of actions and best practices for the TTC to adopt gaseous fuels to deliver a resilient path from high carbon vehicles to low/zero carbon vehicles. This statement contains the odd phrase “a resilient path” to CNG. This implies that Toronto actually wants to follow that path rather than merely experimenting with a future decision on which technology(ies) it might choose. CNG has special infrastructure requirements and constraints on where it can be used, and this triggers an “all or nothing” response because even a few buses would require infrastructure changes at garages and central maintenance depôts. Wilson Garage was once fitted for CNG, but would have to be updated to current standards. Two variants on CNG are RNG (R = “Renewable”, aka Biomass) and Hydrogen Fuel Cells for which natural gas is one potential source of hydrogen (albeit with a high side effect in production of greenhouse gases). These too will be reviewed. This clearly intends to be a way to shift existing diesels onto an alternate energy source, if this is feasible, not necessarily to embrace CNG as a permanent addition. There are two problems with this. First, much of the “end-of-life” fleet is about to be retired as part of the TTC’s move to a shorter planned lifespan, and the newer clean diesel vehicles, some just in delivery, are nowhere near “end-of-life”. Second, a move to CNG requires infrastructure and implies a longer-term commitment to the technology. CNG requires a charging station, and part of the study will include a review of financing options: would the station be built and owned by the TTC, or provided by Enbridge or a third party on a lease basis. Enbridge will work with TTC to render a report that provides recommended course of actions and best practices for the TTC to adopt gaseous fuels to deliver a resilient path from high carbon vehicles to low/zero carbon vehicles. Deliverables would include business case which includes life cycle costs, capital costs, Operating and Maintenance costs and any related cost avoidances. The lobbyists earned their keep with this special pleading for CNG. It is unclear what the makeup of the next TTC board will be and which vendors/technologies will have “friends at court” to ensure their options do not fall off of the table. Although the report provides some information on the anticipated reduction in diesel fuel costs, it is silent on the cost of the alternatives whether they are electricity or an alternative such as CNG. To the extent that there are any cost estimates, they are buried in rolled-up numbers that give only the capital and operating components of an anticipated cost/km. Those numbers involve assumptions about the number of kilometres of travel over which annualized capital costs could be charged, and any technology that fails to meet performance targets will see a big jump in the capital component of total cost/km. Third-Party Investors: potential investors in technology and capital have approached TTC staff with offers to discuss potential funding opportunities. The next step is to confirm with interested parties what they are offering (e.g. shared cost-benefit arrangement, cost of capital financing, etc.) and to consider whether there is value in pursuing these opportunities given the comparatively low rates at which the City of Toronto secures its capital. Through discussion with all relevant stakeholders in City Finance, Legal, Procurement, and others, a strategy is to be developed and then presented back to the TTC Board for approval. As per Recommendation No. 4, this report is targeted for Q4 2019. This shows the desperation the City and TTC are getting to with creative financing of infrastructure, not to mention the degree to which various industries seek to profit by financing rather than selling equipment and systems to the TTC. A related problem here is a question of the allocation of costs to budgets for subsidy purposes. There are many questions to be asked about the viability of new bus technologies both from the technical/operational viewpoint, and about the financial implications of investing in a more expensive bus technology just when the TTC was poised to concentrate on traditional diesel buses, out of favour though they may be, to reduce costs. It is not clear that funding governments, including the City of Toronto, will back up their “green” commitments with new money, especially when the TTC is already considering ways it can shave other parts of its capital program to free up funding for new buses and infrastructure. We have yet to learn how much “going green” will cost Toronto in other, foregone improvements to the transit system. This is not to say that “green is bad”, but it is not free, especially at the outset, and Toronto must be prepared to pay. Meanwhile, the technology promoters will take advantage of the temporary availability of special subsidies to make their products appear “affordable”, and the lobbyists will dine out on the spoils. Discussion and motions from the Board meeting. There was considerable discussion among Board members about this item and about whether there should be a streamlining of the investigation process for new green bus technologies. A major problem here is the enthusiasm of some advocates exceeds the actual capabilities of various technologies for urban transit applications. Recognizing that the bus fleet plan addresses projected ridership to improve service and promote further ridership growth, staff is requested to advance a 9th garage. In light of new information presented in this report, the TTC Board rescind its direction issued on November 13th, 2017 regarding the requirement for staff to report back on the transition from end-of-life diesel buses to Compressed Natural Gas (CNG). The first two clauses of this motion passed, but the third did not. The need for a ninth bus garage beyond McNicoll (which will be the 8th when it opens in 2020) has been acknowledged by staff for some time. Even with the offset of buses being replaced by LRT and subway lines (TYSSE, Crosstown, SSE), ridership growth will drive a need for more buses, and hence more garage space. This is one of many currently unbudgeted capital items. The reference to “zero emission buses” and the associated third clause were an attempt to stop further work on CNG. Some members of the Board are gung-ho on an all-electric future, but others are concerned that this is not yet a proven course to take. It is not yet clear, for example, that the range for a charge of a battery bus will be sufficient to cover routine operations, or the effect of weather on battery performance. Conversely, there is always the option of charging stations along a route, but this only works if the process is fast. Four hours for a full charge does not fall into this range, and even a “top up” would be a non-trivial delay. There would also be a limit to how many buses could layover (at, for example, a terminal loop) recharging. It is conceivable that a “mixed mode” operation with CNG buses for the busy long-haul corridors and batteries for the smaller, local, routes would be a workable mix. That said, the idea of electric vehicles which inherently can involve sparks when connecting and disconnecting from charging stations will have difficulty co-existing with CNG where spark suppression is essential. “Fossil fuel free” could mean two things: one is that only electricity would be eligible (leaving aside how the fuel that produced it in the first place), while the other is that biogas, more recently termed “RNG” (“R” = renewable) is not fossil fuel, and hence would not be precluded. There is some debate about the relative emissions of RNG vs CNG. RNG advocates claim that because methane from decomposition that would otherwise be lost to the atmosphere is captured and burned, that this makes RNG a zero emission fuel on a net basis. However, the period of natural decomposition is considerably longer than the rate at which biomass would actively be converted, and so the “saving” occurs over an extended period while the actual use is immediate. The actual balance has not been set out to permit a comparison. In any event, the gas that would actually be burned is methane regardless of where it comes from. If the TTC contracted for a supply of RNG, it would not be that gas, specifically, that would power buses, but rather the TTC would be financing RNG production that became part of the overall feed of gas into the distribution network. There would not be a discrete pipeline from a biomass digester to a refinery to the TTC properties any more than there are dedicated electrical facilities linking renewable sources through the network to consumers of “green” energy. The third clause has two problems. First, it assumes that the TTC actually has a bunch of end-of-life diesel buses awaiting CNG conversion. In fact, the older buses are now being replaced either with brand new “clean diesels” or with hybrids. The question would be whether at some point in the mid 2020s any remaining diesels should be converted to CNG. However, the youngest diesel buses in the fleet would, at that point, be more than half way to retirement assuming a 2018 purchase and a planned 12-13 year lifespan. There would not be much “end of life” to capture in the then-surviving diesels and it is hard to understand the value of such work on buses that would have at most six years left before retirement. Second, the scheme presumes the availability of CNG infrastructure, something that is far from certain unless the TTC planned to actively shift to CNG for new vehicles. This is portrayed as a way to reduce emissions faster, but it is actually a Trojan horse to get CNG into the fuel mix at TTC under the guise of greening the diesel fleet. Staff will continue to study the issue, but much more clarity is required in the exact purpose and longevity of any shift to CNG at the TTC. The question of reliability for electric buses came up with specific reference to the Los Angeles Times article detailing problems with their trial fleet of BYD vehicles. Staff reported that the difficulties stemmed from poor quality in the buses which are being manufactured by a US firm in California as part of a local job creation requirement. However, this does not address problems with vehicle performance and the mileage that can be achieved on one charge. That value could also be affected by the colder northern weather, a problem Los Angeles does not face. Thousands of pages of public records and interviews with those dealing directly with the company show BYD to be a skilled political operator. The company’s business model involves hiring lobbyists and grant writers to secure no-bid purchases by public agencies, and it has invited public officials on foreign junkets and employed their close associates. Those officials then repeatedly came to the company’s defense as concerns about the buses heightened. If the TTC is serious about evaluating electric bus technology, this should be a fair and open comparison between vendors, not a sweetheart deal. Too much is at stake in the future of bus service quality for the TTC to be suckered (or worse) into buying buses that do not deliver on their promises. It is ironic that so much invective is directed at Bombardier for their streetcars, while would-be providers of new buses get a free ride. No significant move on a new bus order will be undertaken by the current Board or Council, in spite of the best efforts of some Board members to advance the interests of specific bidders. Further reports will deal with garaging and maintenance issues for fleets of various technologies and for service growth, and no commitment to a specific technology is possible until the electric bus tests have completed in 2020. 1. Why would a CNG-based garage require a substation and backup generator comparable to facilities at an all-electric garage? Staff have replied that, in fact, this is incorrect and is a case of unclear writing in the report. The context was for a mixed-mode garage that would have both CNG and electric vehicles. Clearly, if only some of the vehicles at a garage are electric, then the electrical facilities would not have to be as large. This brings us to the whole question of whether CNG will be required for routes where performance of battery buses would be unacceptable. Such a position in itself implies that the battery technology has some way to go compared with CNG, but there is a strong political push toward the battery “zero emission” option. 2. Do the costs shown in the Key Performance Indicator chart exclude or include the effect of PTIF funding? Both versions were shown in the November 2017 report. Staff replied that the updated figures reflect revised estimates for power cost (lower) and capital cost (higher) that on balance produce a lower cost/km than in the November report. However, this assumes that the buses actually achieve the mileage per charge that is claimed. Staff also agree that PTIF, while it supports the current trial, cannot be counted on for a full-scale fleet purchase starting in 2025, and the cost comparisons should not include this. ← Will Toronto Get More New Streetcars? An Opinion column by Matt Tomich in today’s Star gives number of TTC diesel buses to be ordered as 729 while the article here quotes only 310. Is he behind the times? Steve: Yes. That number dates from before the TTC’s decision to shift to a zero-emission bus strategy. The only remaining pure diesels in the pipeline are an order for 310 to be completed this year. There will follow a period of joint hybrid and battery bus procurement with the size of the latter to be dependent on the success of the trial period with 60 buses from late 2018 onward. From 2025, all purchases would be zero emission. Any word on success of these new RNG buses? Surrey, BC has them. Also, one year ago LA Metro was supposedly ordering 295 RNG buses. Have any been put into service there yet? Now, if someone could invent a NHA (Natural Hot Air) bus we could get lots of free fuel from Queens Park and plenty more from Ottawa! Steve: RNG is still a form of methane like CNG. The only difference is the source of the gas. The main advantage is that the source is material that might otherwise be garbage or landfill, rather than fuel extracted from the ground. On the assumption that decomposing garbage would produce methane anyhow, it is claimed that capturing and burning this is better than just letting in escape into the atmosphere. The bus order was authorized by the LAMTA board in June 2017 as an order for CNG buses. Delivery is to be in 2018-19, but I was not able to find any reference to actual RNG operations. There was a separate authorization for supply of RNG that presumably is linked to this order. It would fuel one bus garage. It is important to note that LA already is an all-CNG city and this does not represent a new technology for them. However, LA wants to go all electric by 2030, and so CNG/RNG is where they are sitting right now. In Toronto, the question is whether it is economical to retrofit existing buses with CNG propulsion for a limited remaining lifespan, or simply let the diesel fleet expire as it is replaced. Unlike LA, Toronto has a large fleet of Hybrids whereas the LA fleet was all diesel buses. The conversion to CNG started in the mid 1990s and as of 2016, less than 100 buses operated under contract are diesels. The Star piece quotes a large saving in GHGs for RNG, but this is not relative to electric buses. The near-zero emission status for RNG comes from the methane capture I mentioned above. It is clear that there is keen rivalry between the advocates/vendors of battery buses and those seeking a bigger market for gas-fuelled vehicles. This was obvious with competing presentations to the TTC Board. It is worth noting that this Op Ed came from an author in the same group, Energy Vision, as a similar piece in New York’s The Villager. By citing the much larger original plan for diesel purchases, the piece in the Star sets up a false comparison with the updated plans. Conversely, one might argue that the infrastructure requirements for RNG are simpler than for electric buses, and so this discussion is far from over. To those who think e-buses are not used much around the world, wrong. The city of Shenzhen, China (which connects Hong Kong to mainland China) is home to 16,359 electric buses, in that one city alone. The 30 to 60 e-buses the TTC is getting is small, very small in comparison. Steve: And it is worth noting that Shenzhen is something of a captive market for these vehicles being the home of BYD’s battery production. BYD got into the bus business as a new market for their batteries. Los Angeles’ experience with these buses, as reported in the LA Times, has not been good. This does not mean that the technology is inherently bad, only that what has been supplied in an important market is having a hard time competing with existing CNG technology there. This odd considering the size of BYD’s operation and the length of time they have been developing the technology. China has a big push on for electric buses as part of their anti-pollution strategy. See also Bloomberg. I’m tired of hearing of the newest snake oil that’s going to be viable very soon ™ whether it be battery buses or self driving buses. We’d already have perfectly good zero emission vehicles if the Liberals had gotten off their asses and built the LRT lines to replace the busiest bus lines. That would have taken care of the biggest offenders. I’m also going to have to take issue with putting battery buses at suburban divisions again. Have they learned nothing from the hybrid debacle? And enough with this CNG nonsense! Electric buses are not very safe. Until safety is addressed, it is not a good idea to jump straight to it. With self sealing tanks, vehicle crashses generally do not cause fires. Gasoline and diesel also do not burn all of their volume quickly. If one is to pour gasoline on a house, it will be a long fire since only the surface of of the gas is reacting with oxygen burns. In an accident with electric battery vehicles, the lithium batteries can release its energy very quickly. Look at the Tesla crashes, the vehicles were all burnt if the batteries were ruptured. There is nothing wrong with electric technology. It is just a bad idea to carry electricity in batteries for use in transportation. If we have tram buses or trolley buses, the lack of NVH would be an upgrade in the customer experience. The difference is that a tram bus and trolley bus does not store large amount of electric energy on board. Pulling it from an overhead is very safe and efficient. In an accident, the power pick up device usually loses contact with the overhead. With no energy on board, fires do not happen. Battery technology has not reached a point where it is an energy dense as liquid fuels. If it has, there would be no need to talk about hydrogen rail for GO Transit. Why deal with the conversion loss, if we can put a giant battery on a GO locomotive. It will charge itself at Aldershot, Union and Oshawa Station. Just look at the Tesla freight truck. It is not going anywhere fast. I wonder how trolley buses would compare. Did somebody say trolleybuses?….This whole thing smells of disaster. 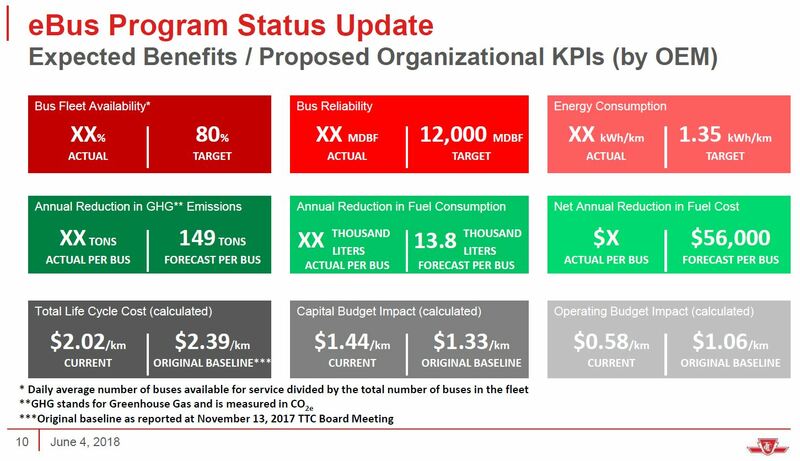 Steve: I sense that TTC staff are hedging their bets with multiple technologies, but it’s amazing how an environmental bandwagon, the availability of piles of money and the clear effect of lobbying by vendors turn a board who normally are loathe to spend a nickel into gung ho advocates for a major change in the bus fleet. Fortunately, the TTC is not diving completely into battery buses without some solid experience. The fleet plan shows a switch to those vehicles in 2025, but all of that is dependent on the buses actually working. On some routes – probably favourably. On all routes – very likely poorly. Trolleybuses require a significant investment in fixed infrastructure. While this might make sense on very crowded, busy routes (e.g. 29 Dufferin) there are a lot of routes where this wouldn’t make sense. Putting up overhead wires for a bus that comes every 20 minutes? Using battery-powered buses would allow multiple lines to share charging infrastructure (in a garage, at common termini, shared sections of a route, or at intersections where multiple lines meet) and would reduce the requirement for fixed infrastructure overall. Electrification of the entire TTC fleet is a laudable goal. Eventually, all TTC vehicles should be electric with zero street-level emissions. The question is how and when. I would prefer to see the TTC/City/Province focus on first “upgrading” the busiest parts of the bus network to LRT, as has already been proposed countless times. In the meantime, let’s buy more streetcars so that we never need to have buses “helping out” on streetcar lines due to crowding, and see where and how the existing streetcar network could be extended to replace (parts of or entire) bus lines. LRT/streetcars are a tried & tested approach to electrification. So are trolleybuses. So the next step would be to identify busy bus routes which are not candidates for LRT conversion but where the level of service would support the investment into fixed infrastructure. Those could be converted to trolleybus operation. Then one could look into replacing the rest of the buses by battery-powered EVs, and by then it would be pretty clear if a large-scale deployment of such vehicles in Toronto is viable or not. I am glad this test is being done (it’s only 30 buses, after all), but I hope the City doesn’t hastily order thousands of units of an unproven technology. Now if only New Flyer or another vendor offered articulated trolley buses, with a small battery for detours…perhaps with a small order of 60 buses, and a realistic test program based out of one garage, like I don’t know, Wilson Garage to test on Dufferin and Bathurst. If only such a magical technology existed. On a serious note, would you happen to know Steve where NovaBus are in this? I know the LFSe is being tested on just route on the STM, but is there a reason they weren’t considered? The range or long charging intervals? In other words, they were not in a position to be included in discussions as a potential vendor at that time. Given that the TTC current fleet of newer buses is mostly from Nova, I am surprised that Nova is not part of the 30 electric bus test. I thought that Nova has an electric bus option? Steve: See my previous reply. DC uses the Proterra buses for their Circulator system. They’re leaps and bounds over the existing set of Circulators – and the actual Metrobus vehicles. No real issues yet (with yet being the big word here, given how this system operates). Thanks Steve for this very insightful piece. I’ve been following London UK’s lean towards zero emission buses and their failed attempts with hydrogen early on. They may be a few steps ahead of TTC, but they are still adding trickles of electric buses for feasibility. In a city and country where climate is much more moderate than it is with Toronto, I fear the negative impacts from extreme hot and cold days that we get 3 months of the year will leave a sour experience with our experience with electrics. Having a stranded electric bus due to severe range depletion would be very inconvenient. I’m very curious to see how the electrics would perform for Nordic countries or our neighbors in Quebec before we make a full commitment. Shenzhen’s electric fleet is most definitely staggering, but there’s no word if that many buses are needed because they are rotated into service or perhaps BYD needed to build as many of them in order to show case their technology with an over-sized fleet. BYD may have offered tremendous support and infrastructure builds for the city of Shenzhen to support this many buses. It leads me to question if they are able to operate at >80% capacity of the 16K buses effectively. If there are about 1000 routes (according to wikipedia) would that mean averaging about 12-13 buses per route are in operation daily? Of course routes are in different lengths and variable demands and can’t be easily simplified, but it would be an interesting analysis to see how well the electric buses of Shenzhen are serving the individual routes and their charging patterns, it would definitely help make their use case more applicable than just sheer number of buses that are now electric. Might running some form of bio-diesel not perhaps be a more cost effective alternative. It would offer the carbon neutrality, without the high cost. There is also an emergent technology, with regards to algae based oil, and oil made from extraction of carbon from the atmosphere. Either of these would allow a purchase of alternate fuel sources, as opposed to having to lead the parade in new technology. Steve: Bio diesel has performance problems because the energy content is lower, and the “bio” component is only part of the total fuel used by a bus so that the diesel engine will still work. Quite bluntly, in the US it is a sop to Big Agro to soak up a lot of excess production. And the Americans gripe about our agriculture subsidies! As for “carbon neutrality”, that has to be calculated all the way down the line including the components of sourcing and refining the biofuel. Could the TTC build a hybrid garage in the future so that while streetcars or subways aren’t running at peak power, the extra voltage and power storage could charge the bus fleet? Obviously this would require land. Steve: The concept of “extra” power requires that the capacity be somewhere it can actually be used. There are only a few streetcar and subway yards, and none of them is near land that could be used for a bus garage. I have been a lifelong supporter and fan of transit and one of the major reasons is the beneficial effect on the environment offered by this alternative. However, I have problem with the desire to rush headlong into zero emission (at point of travel) buses when the addition of more bus riders is so obviously beneficial to the environment regardless of the type of bus used. If 60 SUV drivers elect to take a diesel bus to work instead of driving then the pollution/GHG benefit is immediate. The additional saving that is achieved by changing that diesel bus to an electric or CNG bus is far lower than the advantage that would be obtained by increased transit that attracted another 60 SUV drivers. The mad rush to replace the bus fleet with unproven technology at great expense does not seem to me to be the best use of scarce dollars employed to promote transit as a contributor to a better environment. The modal split at the moment greatly favours single driver cars. More transit would be beneficial no matter what type of buses are used. Electricity is “zero emission” on the road where the bus runs. It is not zero emission on the street where it is generated. The idea that electric propulsion suddenly makes transportation “pollution free” is just nonsense. The entire life cycle of various alternatives needs to be measured to ensure the best choices are made. Impacts such as reduced overall service life, high maintenance, using rare earth minerals and reliability of service may not always show that electricity is the best choice. 1. Zero street-level emissions is by itself a worthwhile achievement, especially eliminated NOx particulate emissions that diesel vehicles emit which are particularly harmful to human health. 2. Nobody seriously claims that electric transportation is “pollution free”. 3. Ontario’s energy production mix in 2015 (link) was 58% nuclear, 23% hydro, natural gas 10%, non-hydro renewables 9%. All the coal plants have been closed. Natural gas is the cleanest-burning fossil fuel (coal being the worst offender in terms of both CO2 and particulates), whereas the others have negligible CO2 and particulate emissions compared to fossil fuels. I am assuming that when Ontario has an energy shortfall that is mostly imports electricity from Quebec or Manitoba (97.2% and 99.5% electricity from hydro, respectively, source: Wikipedia, looks like 2010 data). Therefore electric vehicles are vastly less polluting than ICE vehicles no matter how you calculate it. 4. Even with coal-generated electricity, EVs produce less emissions per km since they are more energy efficient. Furthermore you have less points where you can control pollution in bulk. If you improve the filtering at a power plant smokestack you’ve just improved the total emissions per km of all BEVs on the road. You can’t do that with ICE vehicles. 5. Rare-earth minerals are not really that rare (the name is a bit of a misnomer) and batteries can be recycled so that the rare-earth metals are reused, i.e. not every battery needs freshly-mined metals. 6. I don’t know where the idea of “reduced overall service life” for electric vehicles comes from (maybe hybrids? but those are not the same as BEVs). Electric vehicles should have a longer service life than ICE vehicles, since they are simpler and there are less things to break down. You can confirm this by comparing the service life of trolleybuses and streetcars to diesel buses (for trolleybuses, roughly double, streetcars even more). 7. Again I don’t know where the idea of “high maintenance” comes from (again, maybe hybrids?). EVs are easier to maintain since they are significantly less complicated than ICE vehicles: there are no oil changes, brake pads are changed orders of magnitude less frequently, there are vastly less moving parts, etc. 8. Reliability of service is obviously the main sticker here, and is mainly connected to two things 1) deployment hiccups related to any new technology; 2) range of vehicles (battery capacity). Issue 1) will be ironed out with enough field deployment and realistic testing. Issue 2) is the main longterm issue for which no magical solutions exist. Wilson Garage is next to Wilson subway yard. Steve: My response was to a question of whether the TTC could build (net new, by implication). Of course Wilson Garage and Yard are neighbours. Claims that electric vehicles are necessarily easier to maintain are at the very least speculative. While an electric motor has fewer moving parts, I don’t see lot of evidence that all the parts in a diesel engine make them exceedingly unreliable. (The turbos do seem to go from time to time.) And remember that a battery powered vehicle now has a battery pack, which requires charge management, and most likely provisions for heating and cooling. Anyway, buses are rarely retired due to powertrain issues. The engine or transmission can always be replaced. The retirements are often determined by frames rusting and cracking. On a major rebuild, it’s not simply the engine and transmission that are worked on; the body panels, floor, doors, roofs etc. are stripped and redone. Today’s Star lead letter to the editor from Alan Schaeffer of Diesel Technology Forum refers to: Renewal diesel has multiple benefits. How does renewal diesel figure into all of this? Steve: This sounds like a variant on biodiesel, the process of adding some component, in this case recycled oils, to virgin fuel. The point of comparison is faulty because the writer addresses a proposal for “renewable” natural gas, i.e. “biogas”. It’s still a diesel engine with all of its emission problems. What you can see playing out here is the various factions of the energy sector and the bus industry jockeying for position. Hydrogen fuel cell buses such as those used in India should also be looked into. Steve: There is consideration of that technology, but there are big problems including the source of power for electrolysis or a feedstock fuel (CNG) for production of hydrogen. Every time there is a conversion of energy form, there are losses. “Claims that electric vehicles are necessarily easier to maintain are at the very least speculative. You seem to be conflating two things here: reliability and maintenance costs. Of course diesel engines (especially properly maintained ones) are extremely reliable: they are a mature, extensively deployed technology which is more than a 100 years old. When people speak of electric motors being easier to maintain than diesel engines, they mean there is simply a lot less to do: no oil changes, filter changes, spark plug changes, transmission fluid changes, etc. etc. That EVs are easier to maintain is not speculative at all: it has been proven in the field. There a bunch of studies on this. Batteries have no moving parts. The battery management systems are also all solid-state electronics without any moving parts. The failure rate for such systems is magnitudes lower than for mechanical systems with moving parts. Modern ICE vehicles are also chock-full of electronics and rely on the onboard computer and connected electronics to manage the engine, emissions levels, fuel consumption, and a bunch of other things. When something major fails on your car, it usually isn’t the onboard computer but a moving part or a tube carrying some liquid. This is an exaggeration, to put it mildly. Electric vehicle crashes also generally do not cause fires (otherwise, almost every crash involving an EV would start a fire, which is definitely not the case). EV manufacturers are putting a lot of work into battery safety. Batteries come equipped with various safety systems – the equivalent of the self-sealing tank. They also get placed as far away as possible from the crumple zones, etc. The manufacturers do think about this a lot. Proterra, for example, claims that its battery pack is encased in “ballistics-grade” material. This is not something which easy to rupture, I presume. Also keep in mind that a bus is larger than almost any other vehicle on the road except a semi truck. In the average crash involving a bus, it will be the smaller vehicle that will be taking more of the damage. Just as there is a lot of hype around EVs, there is a lot of FUD. EVs are just as safe, and we cannot define “safety” by one metric only. On the other hand, trams and trolleybuses require a high-voltage distribution network throughout the city, failures in which can be very dangerous. Here is a story from last year about exploding overhead tram power lines in Melbourne, setting fire to a tram. There is a potential for accidents in every system. This is true. However, they don’t need to be. They are already energy dense enough now for some applications. Furthermore, since EVs are more efficient than ICEVs (less energy needed to drive per km), energy density of batteries does not need to match that of liquid fuels to achieve the same range. It does still need to grow, but not to match it to deliver equivalent vehicle performance. If batteries ever become as energy dense as liquid fuels, that means an EV will be able to get a much better range than an ICEV. The only reason we are talking about hydrogen rail is because some salesmen for the technology has made a semi-successful pitch to some government officials. Otherwise it’s a nonsense technology for GO Transit. What? The Tesla Semi is not even in production yet, but major companies such as Walmart, Pepsi, Loblaw, UPS, DHL, FedEx, Anheuser-Busch, etc. have made reservations. We are talking hundreds of orders (e.g. Pepsi 100, UPS 125) for something that is still just a prototype. Whether it will be successful remains to be seen, but saying that “it is not going anywhere fast” is simply not true. I would add one more thing. It is frequently mentioned that methane is a more potent greenhouse gas than CO2, so some advocates of burning “RNG” would claim it’s better to convert it to CO2 than to let it leak into the atmosphere as methane. However, this misses one important point: methane sticks around in the atmosphere for a much shorter time than CO2 does. Methane persists in the atmosphere for about 12 years, dissolving via chemical reactions. CO2 is most easily removed by dissolving into the ocean (this can take from decades to centuries and is difficult to calculate exactly) while the CO2 which does not “go away” in this manner, can persist in the atmosphere for hundreds or even thousands of years. So it isn’t exactly clear that burning the stuff is better, emissions- and climate change-wise. Andre said: You seem to be conflating two things here: reliability and maintenance costs. Of course diesel engines (especially properly maintained ones) are extremely reliable: they are a mature, extensively deployed technology which is more than a 100 years old. When people speak of electric motors being easier to maintain than diesel engines, they mean there is simply a lot less to do: no oil changes, filter changes, spark plug changes, transmission fluid changes, etc. etc. Okay, although I’d be surprised if spark plug changes on a diesel engine comes to any significant sum. Nevertheless, maintenance costs for oil changes and such are going to be a pretty minor part of the cost of maintenance of a bus. Andre said: That EVs are easier to maintain is not speculative at all: it has been proven in the field. There a bunch of studies on this. Andre said: When something major fails on your car, it usually isn’t the onboard computer but a moving part or a tube carrying some liquid. How much work do you do on your own car? How old is your car? How many km? What do you count as a “moving part”? Because my experience with my cars tells me that the engine and transmission and their oily bits are generally not the cause of issues. Electronic sensors can be, but of course battery packs and electric motors have their own sensors. I know Tesla fans claim “My car is going to be soooo reliable! It only has one moving part!! !” They seem to forget driveshafts, wheel bearings, HVAC systems, doors and windows, and all the other moving parts on the car. Unless Teslas magically don’t have wear on their suspension or rust on their brake lines….which I kind of doubt. Well, the spark plug changes will be very cheap on anyone’s diesel, since they burn fuel through the heat of compression, not spark plugs. At present, it seems that Mazda is close to accomplishing this, with the aid of a very small supercharger, in gasoline engines. All of this efficiency is laudable, though it took CAFE standards to press the auto industry into their flash of creativity. I don’t think that Tesla will be the sole power in the success of the electric automobile motor in 2-3 years. It’s nice to see a starter company doing so well, but the world won’t have to depend upon Elon, if he falters, for fairly cheap, mass produced electric buses. Any kind of fuel burning engine is simply much more complex than electrical counterparts, as has been established by several people commenting above. Andre S. posted a number of points that are spot on, though some have questioned them. The maintenance costs of an EV are definitely reduced over internal combustion powered vehicles. So much so that this is a major reason why car dealerships are reluctant to push any EV offerings their manufacturers have – they simply don’t see the cash flow resulting from maintenance down the road. While anecdotal, my own experience with an EV backs this up. When purchased, I opted for a maintenance package that covers all the wearables that the bumper-to-bumper warranty doesn’t cover based on the cost of two full brake jobs over the six years making it worth the price. I have come to realize that the level of regenerative braking that occurs may not make that so. As with most every discussion regarding EVs, there is always the occasional person who has to be pedantic about the term “zero emission” the way that one kid in every classroom has to remind the teacher that s/he did not give out homework. It is understood that “zero emission” means “at the point of use” and certainly does not mean “zero pollution”. Like many other phrases in life, ZEV (Zero Emission Vehicle) is one that is not 100% literally correct. Even with coal-generated electricity, EVs produce less emissions per km since they are more energy efficient. Furthermore you have less points where you can control pollution in bulk. If you improve the filtering at a power plant smokestack you’ve just improved the total emissions per km of all BEVs on the road. You can’t do that with ICE vehicles. I have made the “even with coal-generated electricity” point before. The only thing I will add to these words is that there is a huge advantage to burning a fuel in a large scale operation where the benefits of scale, higher overall efficiency, and operation at the optimal efficiency point on a machine’s input-vs-output curve can be achieved. Internal combustion engines have a fairly low maximum efficiency (about 30% for gasoline, 40% for diesel), and that is only achieved when the engine operates constantly at its optimal speed-vs-torque point. Calvin Henry-Cotnam said: The maintenance costs of an EV are definitely reduced over internal combustion powered vehicles. So much so that this is a major reason why car dealerships are reluctant to push any EV offerings their manufacturers have – they simply don’t see the cash flow resulting from maintenance down the road. While anecdotal, my own experience with an EV backs this up. When purchased, I opted for a maintenance package that covers all the wearables that the bumper-to-bumper warranty doesn’t cover based on the cost of two full brake jobs over the six years making it worth the price. I have come to realize that the level of regenerative braking that occurs may not make that so. My point is that you can’t extrapolate from your personal vehicle to a transit bus. An electric car may come with a 6 year, 96,000 km warranty. Okay, within that time period, ‘maintenance’ for a gas-powered car will mainly be oil and filter changes, so yes an EV will be cheaper. It’s only beyond that point that a car might require major suspension work, rust repair, HVAC fixes, maybe window or door repairs, etc. And an EV doesn’t inherently escape that kind of maintenance. In contrast, a transit bus might be expected to last up to 18 years (though they seem to be cutting back on this). I have heard that the 7000 series Orion Vs clocked two or three million kilometres before retirement. They require a vast amount of maintenance to make it that far, and a good chunk of that will have nothing to do with the propulsion system. A soundly engineered battery bus may have lower lifetime maintenance costs than a similarly engineered diesel bus, but at this point I’m not aware of any good comparisons. Certainly what I’ve heard of BYD E-buses is that they’re lemons; hopefully that’s because they are poorly engineered and built, not because of problems inherent to battery buses. The TTC is wise to get a limited number of battery buses and to evaluate their performance over a good span of time, before committing to a full fleet. Battery safety should investigated before we have wide adoption of electric buses. For the record, I am not against battery electric buses. However, we cannot have a barbecue of people when a bus accident occurs. Look at the recent accidents which involved Tesla’s battery pack being ruptured, we should wait until the NTSB’s report before proceeding. Electric vehicles might not have the maintenance required for a ICE vehicle. However, battery replacement cost are expensive. One faulty BSM chip can render a $10000 battery useless very quickly. The replacement cost of Tesla batteries are well into the five digits. Looking at the KBB values for used Teslas, the depreciation are very high due to the fact that replacement batteries cost a lot. The TTC do not want to be in a situation where a $500000 bus has depreciated to less than $20000 and then spend $50000 to replace the battery. Just because someone ordered the Tesla freight truck, it does not mean it is a firm order. Boeing has thousands of orders for their Dreamliners. That does not mean all of them will be delivered and paid for. Sometimes, companies would pay a small deposit to purchase. They will then resell the production slot to another party. Orders get cancelled all the time. Until one sees Tesla freight trucks all over the 401, I would not place too much emphasis on the numbers on the order book. A “Barbecue of People”, I like that , a new collective term for “An Exaltation of Larks” or “The Venery Game.” It would rank up there with a “Murder of Crows, A Parliament of Owls, A Sounder of Swine or a Habit of Nuns.” Thanks to Benny as we always need more collective nouns. That being said Benny is right about getting safety correct. To answer Robert Wightman, from New Flyer’s specs, battery buses are about 15% heavier that diesel buses. Scroll to the bottom for comparison weights of Xcelsior buses. I’m glad Steve and others are scrutinizing these TTC moves, as alas, there’s a batch of good reason to be skeptical and hesitant ahead of a new purchase. There is however, zero doubt of the need to be reducing GHGs, but we are abysmal at actually doing comprehensive work on the GHG equations, including embodied energy and shipping energy, etc. If the federal level really wanted to reduce GHGs, and the TTC was also interested as the City claims it is (our mayor flew to Paris, after all), we’d have an arms-length review of the wisdom of the SSE and the $660M of federal funds, as well as a good estimate of all the concrete proposed to be used as we aren’t counting concrete in any of our GHG accountings, and there’s a double emission from the burning of limestone to get cement. A far better way to reduce GHGs would be to make the buses really run efficiently in traffic, like the busways of Curitiba or Bogota, and hmm, should we have a relief busway on the DVP? That wouldn’t sit well with the votorists of most of the GTA ridings of course, but it’s past time to focus only on the technology, but far more the context, and no, subways in suburbs aren’t the ‘fix’ in the salient transport sector. We need more articulated buses and all of our fleet needs to be electric. The Late Mayor Rob Ford showed us the way with his push for articulated buses and it is good to see Premier Doug Ford build on Rob’s legacy with his push for electric buses. Premier Doug will also abandon the Liberal hydrail project which was a farce and Premier Doug will change it to the proven electric train technology. Thanks to Steve for getting the conversation started. Steve: The TTC has already been planning to buy more artics before Ford was elected, although not in the immediate future. Also, I know of no push from Ford for electrification which he could very well characterize as wasting money on high-cost environmentalism. Hydrail was definitely a farce, although the only savings will be in avoided costs and some studies that might well be wound down. Metrolinx structured the bidding for RER so that the technology decision was left to the bidders. I expect that they fully expected bids to come in for conventional electrification only, or for hydrail at a big premium to offset risk. This talk of energy storage systems sounds a little off. The TTC is already buying an energy storage system in the batteries of all the buses. Buying a second stationary one seems redundant. Initial reports are that even with current battery sizes, the buses need to be topped up during the day or you’ll potentially run out of juice anyway. 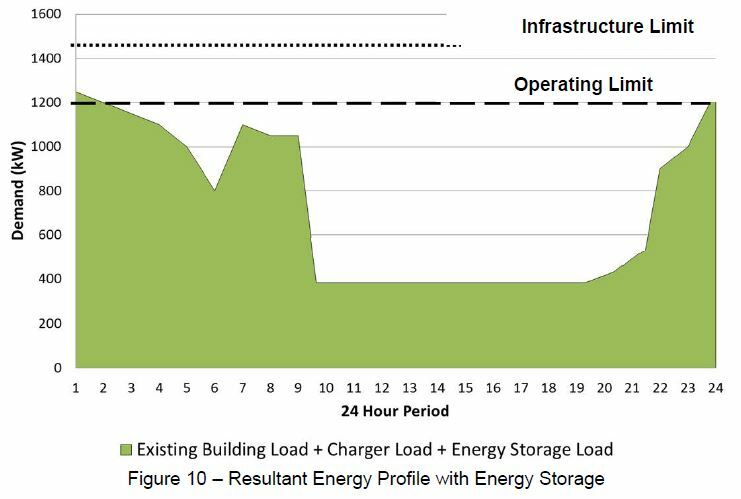 Instead of buying an energy storage system, the TTC should be looking at extra chargers along the route and at the need to build more layovers into the schedule so that buses can charge a bit during the day, thereby reducing the amount of electricity needed at night. My take on the LA Times article is that BYD’s batteries are probably fine, but their manufacturing quality is facing hurdles due to rapid expansion and their bus technology (stuff like doors, etc) isn’t competitive with the current designs from other North American manufacturers. Hopefully BYD will work that out. The suggestions about excessive lobbying seem overblown. BYD knew that most green bus money will initially come California, so they put their factory in California. Proterra was far too clever and put their factory in South Carolina. Of course, California has a preference for spending its environmental tax dollars to hire California workers. They certainly wouldn’t want to send their environmental money to a state that doesn’t even believe in global warming. There’s a reason that BYD is eyeing Ontario for a new truck factory. They know who’s paying. Some people ride transit for environmental reasons. If owning an electric car ends up being more environmentally friendly than riding the bus, then I know I would seriously consider abandoning the TTC and buying an electric car. The TTC needs to both encourage more ridership and moving its fleet to be more environmentally friendly. Ming wrote: …the TTC should be looking at extra chargers along the route and at the need to build more layovers into the schedule so that buses can charge a bit during the day, thereby reducing the amount of electricity needed at night. The TTC needs to be looking at chargers along the route to provide any needed top-ups to get a vehicle through the day. There should be no effort to reduce the amount of electricity needed at night. Night is when there is plenty of capacity to support chargers, which is why electrical rates currently are lower at night. Our electrical supply infrastructure has to be able to support the demand at the very peak, such as at 4 pm on a day that is 35C. In an ideal world, our electrical demand would be met by a supply that was nearly constant around the clock, with individual uses taking more than they need to be stored locally during low demand times and using the stored energy to supplement what they need during peak demand times. Charging batteries is the obvious example, but cooling systems can use night-time energy consumption to freeze blocks of ice that provide cooling during the day that only require electricity to operate fans is one other example. Granted, a 24-hour constant electrical demand would likely come with a 24-hour single price for electricity, but that would be the price of efficiency. Steve: The vehicles that are to be acquired for the 60-bus pilot all use plug in chargers, not overhead pickups, and this means that enroute chargers are unlikely. As for “surplus” overnight power, this is not a sure thing looking out to an era when vehicles all over the city will be recharging, not just the bus fleet. TTC is also looking at pairing an energy storage system with the substation that will be needed to handle the added demand at garages. This allows them to flatten out the demand somewhat. Steve wrote: As for “surplus” overnight power, this is not a sure thing looking out to an era when vehicles all over the city will be recharging, not just the bus fleet. Hence, my final paragraph. It is “surplus” in that it is capacity not currently used. Electric vehicles, private and public, will make use of this and end the “surplus” and, I suspect, the price advantage that comes with it. Steve: This issue was raised in the Metrolinx study regarding “cheap” power for overnight electrolysis to produce hydrogen. First of all, I want to express my gratitude to the extremely high overall quality of the comments on Steve’s blog, regardless of the differing opinions. Perhaps he is a ferocious moderator, in which case this comment may never see the light of day. Steve: I have a well-honed auto-trash list, and clicking on “Delete” is one of the little joys of running a site like this. But regarding trolleybuses, which some people have suggested as a “solution” in Toronto; I am old enough to remember going to high school on these monsters. And I also have fond memories of Vancouver’s old Brills, taking me safely home along Main Street after a late night on the town (as a roadie). Steve: Toronto’s, like Vancouver’s, were single deckers of course. Steve: This statement is not true. TBs and streetcars shared overhead in many places in Toronto and, in some cases, the streetcar wire doubled as the TB positive. Intersections with crossings were extremely common. The really complex stuff was at major TB intersections. And trolleybuses can also be brought to a halt or a tailback if any emergency interrupts the power supply at any point. So modern trolleys must have reliable onboard battery storage, so the operator can pull down the poles and drive autonomously for some distance. AFAIK this is how Vancouver runs its trolleybus fleet now. Steve: Vancouver had TBs with battery backup power when Toronto was still using that argument as a reason for getting rid of them. Management was in bed with the Natural Gas Bus lobby. Sorry, much as I love them I don’t see trolleys as any kind of solution for Toronto. Steve: The greater challenge is that many of candidate routes are already running streetcars. However, there’s the makings of a decent network were it not that the Battery Bus folks and their lobbyists seem to have taken over the debate today.